↑ Gordon Ramsay – The man;– Biography. Retrieved 25 December 2009. ↑ "Gordon Ramsay opens first Canadian venture, Laurier Gordon Ramsay, in Montreal". Gordonramsay.com. Retrieved 27 June 2012. ↑ Laurier BBQ cuts ties with star chef Gordon Ramsay, Montreal Gazette, 15 February 2012. ↑ "The Kumars at No 42 returns to BBC One". BBC Press Office. Retrieved 14 February 2007. ↑ "Laid Bare". The Daily Mirror. Retrieved 29 August 2007. ↑ Weekly Viewing Summary (scroll to w.e 13 May 2007 – 08/07/07). BARB. Retrieved 29 August 2007. 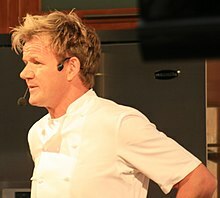 ↑ Deadline.com: "Gordon Ramsay’s Fox Series ‘Hotel Hell’ To Premiere In August", 11 June 2012. ↑ Bretts, Bruce; Roush, Matt; (25 March 2013). "Baddies to the Bone: The 60 nastiest villains of all time". TV Guide. pp. 14 - 15. ↑ Family Marathon. 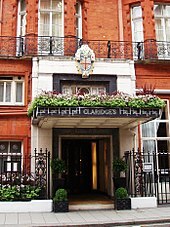 Florahearts.co.uk. Retrieved 27 June 2012.